For large groups, we require a two month (60 day) notice of cancellation/change of plans for a refund of the deposit. If in the case of failure to show on the expected day of arrival, full payment will be taken with no refund. We require a 50-75% deposit depending on the size of group to hold the reservation. We are happy to accommodate groups traveling together. Please let us know more information about your group. Special rates will depend on how many people are in your group. Currently, our maximum occupancy is 22 people. 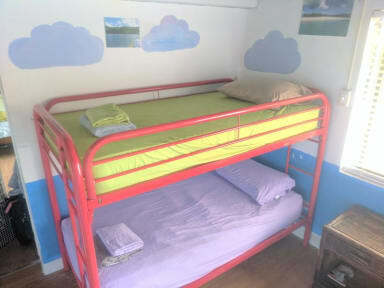 We have 14 bunk beds total, and two private rooms, each with two double beds. 22 occupancy is based on the private rooms containing four persons, two people sharing each double bed. 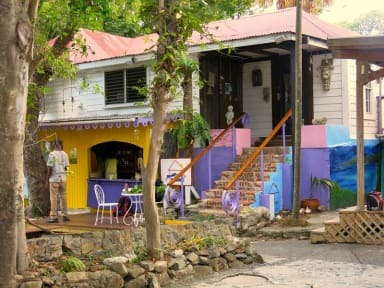 Tillett Hostel and Guesthouse offers a unique opportunity to experience the culture of the Caribbean! We are located in the heart of Tillett Gardens, a community of independent artists and businesses, formed on an old Danish farm almost 50 years ago. Jim and Rhoda Tillett provided a space for local artists to gather and learn from one another, and the community naturally grew into its own eclectic neighborhood. Tillett Gardens features a restaurant, salon, theater, glass art, pottery, leather shop, beads and jewelry, drum museum, a medium, bakery, accounting office, chiropractor, music lessons, candle maker, vintage shop, and a beagle that hunts iguanas, to name a few. In order to check in, we will need to know your arrival time so that we are sure to be on property to meet you. Please call us when you arrive at the airport so we know you are on your way. If you arrive before your room/bed is ready, you may lounge in and store your luggage in our common area. Private room/bed must be vacated, but you still have use of common area should your flight be later. Please strip your sheets so that we can prepare your bed for the next guest!